by Chris Woodford. Last updated: September 16, 2018. Are you a shower person or a bath person? Do you like to feel pulsing jets of water blasting your dirty skin clean? Or do you prefer to laze luxuriously in the tub until the water turns cold? If you wash for less than five minutes and your shower has a modern, low-flow head, you'll save over 50 gallons of water and a huge amount of energy compared to taking a full bath. Saving hot water with a shower helps to cut your energy bills and it's a simple thing you can do to fight global warming. Sounds good? Let's take a closer look at how showers work! 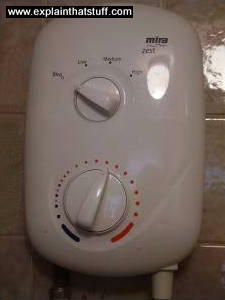 Photo: A simple Mira electric shower. There are two controls for adjusting the temperature. The upper dial sets the temperature broadly as high, medium, or low. Once you've set the temperature roughly, the lower dial lets you fine tune to get the water exactly as hot as you want it. How do mixer showers work? The simplest showers are called mixer showers and, as their name suggests, they work by mixing hot and cold water from separate pipes to make warm water whose temperature is somewhere in between. The most basic form of mixer shower is a Y-shaped rubber pipe that you fit over the hot and water faucets (taps) on a bath-tub. By adjusting the faucets, you create a single stream of water at exactly the temperature you want. The trouble with mixer showers like this is that the temperature is hard to control. If someone switches on a cold faucet or flushes a toilet elsewhere in your home, the cold water supply is suddenly reduced. That means there's proportionally more hot water coming through your shower and, if the water's too hot, you could be scalded. The opposite will happen if someone switches on a hot faucet—you'll suddenly find the shower turning freezing cold! Mixer showers that are plumbed into the wall overcome this problem by using built-in thermostats. They constantly adjust the temperature of the mixed water to ensure you're not boiled like a lobster or frozen like a penguin by water that's alternately too hot or too cold. Most mixer showers also have safety cut-outs that prevent you from turning the water up to dangerously high levels, which is good news if they're being used by frail elderly people or young children. But there's still a basic problem with mixer showers: they typically run off hot water from a tank. Once the tank is empty, there's no more hot water and you have to wait for the tank to fill up before you can shower again. Photo: 1) A typical, thermostatically controlled mixer shower. Hot water and cold water flow in through the two pipes in the wall (top), mix in the valve unit in the center, and flow out through the curly hose at the base, which connects to the shower head. This is a really simple shower: you just turn the knob to switch the water on cold, then keep turning it clockwise to make the water as hot as you wish. Photo: 2) Take it apart, however, and it's a bit more complex! 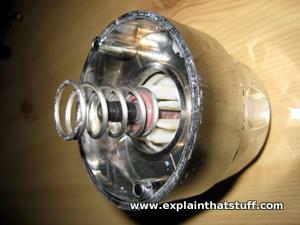 The magic component is that little black cylinder in the middle, which is a wax thermostat. It contains a sealed capsule of wax that expands or contracts, opening and closing the hot water valve and so keeping the overall temperature of the mixed water constant. How does an electric shower work? Electric showers overcome this problem by heating cold water with electricity. They never run out of hot water, so they're a great solution if you have lots of people in your house who like to shower one after another. Electric showers work in much the same way as other electric appliances that get hot, including electric toasters and hair dryers. They send an electric current through a piece of metal called a heating element. This has a moderate resistance, so it gets really hot when electricity moves through it. Cold water flows past the element, picking up heat and heading out through the nozzle where you're standing. 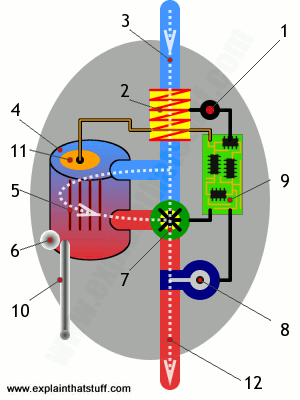 Artwork: The basic concept of an electric shower: cold water enters the pipe at the left, flows past the coiled heating element (red) in the center, and leaves as hot water on the right. You probably know that water and electricity are usually a very dangerous combination, but electric showers are perfectly safe if they're properly fitted. That's because a heating element is a completely sealed unit. The electric current flows through the element, but not in such a way that it can give you a shock. No electricity comes into contact with the water that touches you. For an electric shower to work effectively, you need a cold water supply with reasonably high water pressure to begin with, because the shower heating unit will reduce the pressure of the water as it flows through. If you don't have enough water pressure for an ordinary electric shower, the solution is to fit a power shower. It takes in and heats cold water just like an ordinary electric shower, but it also uses an electric pump to increase the water pressure so it leaves the nozzle with greater force and higher speed. If saving water and energy is important, bear in mind that power showers use 3-5 times more than ordinary showers. That means a lengthy power shower can easily cost you as much as a generous bath-tub full of hot water! A typical electric shower is like a more sophisticated version of a mixer shower, where hot water is heated instantaneously by a heating element but still mixed with cold water to get the final water temperature you prefer. How does it work? Like this! You press or turn the ON switch. This operates a solenoid (electromagnetic switch) that opens a valve on the water inlet pipe. With the valve open, pressurized cold water flows into the shower from your ordinary household supply. 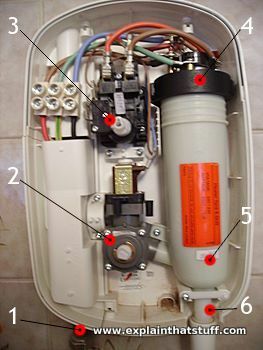 Some of the water flows into a small plastic heater tank (about 0.25 liters in capacity). The tank acts as a hot water reservoir, helping to ensure both a constant flow of hot water and a much more steady temperature. It also helps to even out temporary "overshoots" and "undershoots" in temperature that occur when you suddenly turn the temperature dial up or down. Powerful heating elements inside the tank (sometimes rated as high as 10.8kW—about five times the power of an electric kettle) instantly heat the cold water. The water heats up much quicker than in a kettle because you have maybe a half or a quarter as much in the tank and five times the power at your disposal. In passing, let's just note that there's a handy little silt trap at the bottom of the tank to capture scale and debris, which can be emptied by removing a hidden cover. Heated water from the tank and cold water from the supply meet up in a thermostatic mixer valve, similar to the ones we looked at up above. The large temperature dial you turn controls this valve, making the water hotter or colder as you require. The thermostat built into the valve tries to keep the temperature constant once you've set it. A pressure flow sensor on the output pipe checks for dangerously low pressure and triggers a circuit to switch off the shower if necessary. An electronic circuit board monitors this sensor and the various other sensors and controls. Different showers are more or less sophisticated. Some are entirely electronically controlled; some are entirely manual. At the bottom of the water tank, a safety valve (sometimes called a pressure release device or PRD) can blow open if the water pressure gets too high. If that happens, water spills out of a small overflow pipe. The water tank also contains a thermal cutout mechanism. If the water gets too hot, a temperature sensor in the tank triggers the circuit and solenoid to shut off the water supply (or sometimes just the heating element) so you don't get boiled like a lobster! 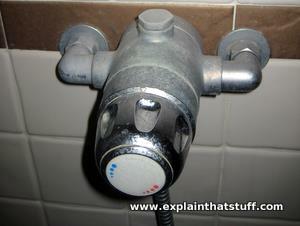 Hot water pumps out to the shower head, just the way you like it. Main flow/temperature control. When the front cover is in place, the large blue-red (hot-cold) thermostat dial clicks into place on here. On/off switch, solenoid, and main (low-medium-high) temperature control. Heating elements. You can see the wires connected to them right at the top. Outlet pipe connected to shower hose (not shown). As you'd expect, the two halves of the plastic case are sealed by a rubber gasket; when they click together, no water can get in to the electrical parts inside. Do showers save energy compared to baths? 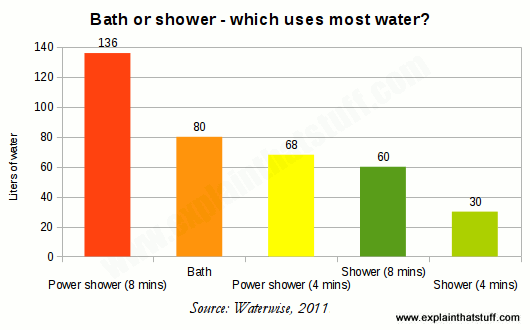 Photo: Chart: Generally speaking, showers use less water and energy than baths, but long power showers will use more. Drawn using data from Showers vs. Baths: facts, figures and misconceptions by Waterwise, November 24, 2011 [archived with the Wayback Machine]. If you have a separate bath-tub and shower cubicle, comparing costs is more tricky. If you know your math, you could read your electricity (or gas) meters before and after taking a bath and shower and calculate the cost using the difference in the readings. Or you could use an electrical energy monitor, though that won't help you if either your bath or shower is powered by gas or oil! Are eco-friendly shower heads worth buying? Photo: Electric showers use heating elements that are almost 100 percent efficient so, broadly speaking, the heat energy you get out is the same as the electrical energy you put in. What that means is that if you want to save on the energy you put in (to help the environment or save money), you must also save on the energy coming out either by reducing the temperature, water flow, or the time you spend in the shower. Use less water (in other words, shower for less time). Use the same amount of water but at a lower temperature. Use a more efficient shower element that wastes less energy. However, most electrical heating elements are almost 100 percent efficient, so this is unlikely to make much difference. Use an electric shower element with a lower power rating (in watts). But if the element is consuming less power (less energy per second), less energy must be entering the water each second as well—so a lower-powered shower is simply going to make the water colder. Photo: Want to save water, energy, and money in the shower? Forget that pricey, eco shower head; this is really all you need. 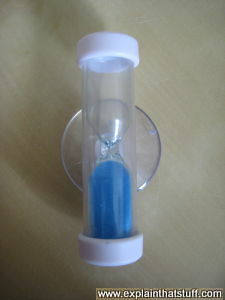 It's a four-minute "egg-timer" on a suction cup. Many water companies give them away for free; check if yours does! So what about eco-friendly, replacement shower heads that claim to save water and money? Again, the conservation of energy tells us that any gains you make have to be lost somewhere else. If your shower is saving energy, it can do that only by reducing the amount of water you're using or the temperature of the water. 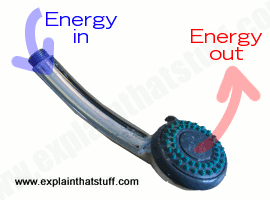 It can't give you exactly the same quality of shower (equally as hot for just as long using exactly the same amount of water) if it's simultaneously saving energy; the laws of physics simply don't allow that! Eco shower heads typically work by reducing the amount of water flowing through them. Since they tend to be quite expensive, they may not actually be saving you any money at all—and you can achieve exactly the same effect by either turning down the water at the faucet (mixer showers usually let you do that, but electric showers often don't), showering at a slightly lower temperature, or showering for less time. How do pulsating shower heads work? Photo: In a pulsating shower head, the pressure of the incoming water (1) powers a small turbine (2) that makes a wheel rotate (3). Holes in the wheel interrupt the incoming water flow periodically giving hammering pulses of outgoing water (4). This is a very simplified version of what's going on; for a much more detailed description and diagrams, see the patent documents listed below. Power showers are great for tired bones, but pulsating showers can be even better if you want to massage your aching muscles at the same time. How do they work? Although there are various different designs, most rely on the pressure of the water jet to turn a miniature water turbine attached to a rotating wheel inside the shower head. The wheel has one or more holes in it so it interrupts the water flow intermittently, giving regular blasts of pressurized water through the shower head nozzles instead of a constant stream. It's a little bit like a garden sprinkler, where a cam driven by the pressure of the incoming water trips the outgoing flow on and off. Black & Decker: The Complete Guide to Plumbing: Cool Springs Press, 2015. Home Plumbing by Andy Blackwall. Haynes, 2015. Plumbing Encyclopaedia by Roy Treloar. Wiley-Blackwell, 2012. Collins Complete Plumbing and Heating by Albert Jackson. Collins, 2010. 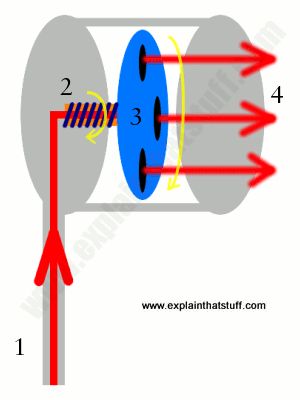 US Patent 4068801: Pulsating jet spray head by Harold H. Leutheuser. January 17, 1978. US Patent 5356077: Pulsating shower head by Sidney J. Shames et al. October 18, 1994.